Gladioli have been out of fashion for many years now and that is a good thing. Why? Because that means the growers haven't been growing them, so I haven't been selling them and now that I have them in the garden they are effectively a brand new plant for me. (I accept that they have always been available as pre-packed bulbs, but a picture on the packet is no substitute for seeing the real thing in full flower). AND WHAT A FLOWER IT IS! 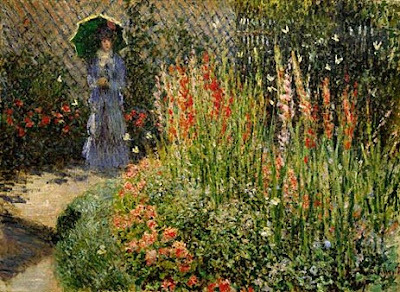 Let's be honest, when it comes to mid-summer flowering plants you won't be faced with much of a selection at your local plant retailer. So how can anyone in their right mind ignore the delights of this outrageously, flamboyant summer flowering bulb? Especially when it does what it does so well. 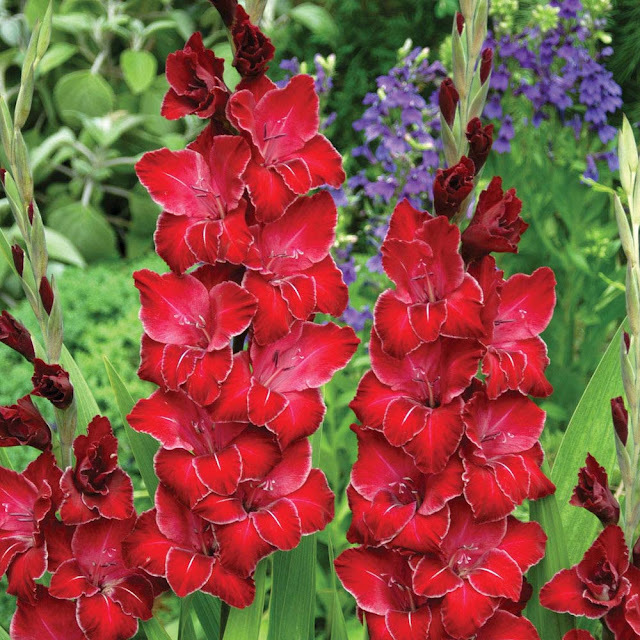 Gladioli are native to Mediterranean Europe, Asia, Tropical Africa and South Africa, but to be fair the center of diversity is located in the Cape Floristic Region, where most Gladiolus species were discovered. They are considered half-hardy in temperate climates, and grow from rounded, symmetrical corms, that are enveloped in several layers of brownish, fibrous tunics. The spectacular giant flower spikes that we see in cultivated varieties are the result of centuries of hybridisation. The flower spikes are large and one-sided, and coloured, pink to reddish or light purple with white, contrasting markings, or white to cream or orange to red. 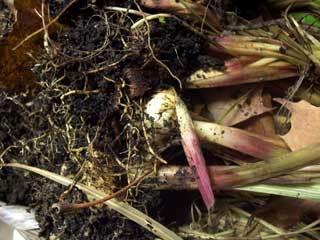 Gladioli seeds can be sown in February or early March, Sow them into seed trays containing a mixture of 5 parts loam, 4 parts well decayed leaf-mold, and 1 part well rotted compost. Alternatively, use a good quality seed compost such as John Innes 'No 1'. Add a generous sprinkling of bone meal and just enough horticultural sand to improve drainage. Sow the seeds thinly and shallowly, gently water and then place the seed tray in a warm, bright position such as a heated greenhouse or warm windowsill. They will need to be kept at a temperature of between 7 - 13 degrees Celsius where the seedlings should emerge four or five weeks later. After germination the gladioli seedlings can be transferred to a cold frame. During the first fortnight in June the seed trays can come out of the cold frame and sunk into the ground so that the compost level in the seed tray is the same as the soil level. They will be happy in sun or partial shade at this point. Keep the roots moist and feed moderately with a liquid feed over the summer. In the autumn, and once the foliage has died back, the corms can be lifted. Remove any compost and dry off so that they are ready for storage. They will then be ready for replanting in the following spring.